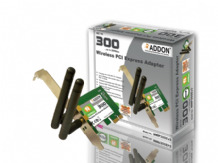 The Addon NWP201E 150Mbps Wireless PCI-E Adapter is a highly integrated and cost-effective Wireless Adapter that provides PCI Express interface, and full compliance with IEEE802.11n and IEEE802.11b/g standards. 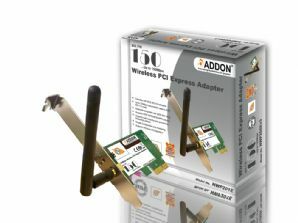 It will make your computer to a high-speed Wi-Fi networking and experiencing the faster file transfers and browse the Internet from greater distances across your home than previous-generation Wireless G technology. When you upgrade your computer with the Wireless N 150Mbps Desktop PCI-E Adapter, it will deliver better and faster in a high-speed wireless network.